Why not make it your self?? I think that it was probably last year when I started looking for recipes on line on how to make my own Fajita mix. You see I really like Fajitas but I don't really like the flavor of the store bought packages...plus it cost a little over $1.00 for a package that you can only use once. Combine all of the ingredients in a small bowl. Pour into small glass or plastic container, seal tightly and store in a cool, dry place. Makes the equivalent of 3 packets of commercial or purchased Fajita Seasoning Mix. When ready to use add three tablespoons of the Fajita Seasoning Mix and 1/2 - 1 cups water (depending on how thick you like it). Reduce heat to low and simmer. I did the pricing and figured to make this recipe the total cost is 0.50 when you buy your ingredients from the bulk barn. Since the recipe can be used 3 times that equals ~ 0.17 cents a serving!!! A savings from the $1.00 packages you buy for a one time use!!! Also when discussing this over with Micah we figured that we also know what is going into the mix which makes it healthier when we don't have all the extra additives in it!! While looking for a Fajita recipe I came across this Taco one as well. I really liked it so now I use it as well. You can add more crushed hot peppers if you want it to be hotter! Combine all ingredients together. Makes enough for one time use. When ready to use just add to meat mixture with 1/4-1/2 cup of water and let simmer. If mixture is too thick add 1/4 cup more water. Let me know of any other convenience packages that you make!! When we lived in our apartment I had two favorite days of the week; Wednesdays and Saturdays. You may be thinking...Katie why were these your favorite days? Well it was because those were FLYER days. On Wednesday's we would get the flyer's for places like Walmart, Drug stores and Giant Tiger. The grocery store flyer's would come on Saturdays. When we moved to our new house I was very sad to find out that the flyer's are not delivered to our house...so I was forced to search else where and what better place to find things but the world wide web! Sure enough I found that Coop, Superstore and Sobey's all have their flyer's online. I simply saved these website in our bookmarks so they are easily assessed when I go to do the meal planning for the week. Also I figure this is great as we don't have as much paper laying around the house. If you know of any other stores that have their flyer's online...please let me know! Rub them with some margarine, non hydrogenated that is, and sprinkle them with a combo of cinnamon and sugar. I cut them into 8's like a pizza and bake them in the oven for about 3-5 minutes at 300. Once they are done I let them cool off and then store in an air tight bag. I use these chips to dip in apple sauce, cream cheese, strawberry salsa and even peanut butter. They make a great snack!!! In a large bowl combine the flour, salt and baking powder. Next cut in the shortening with a fork. When the flour is crumbly, add the water. 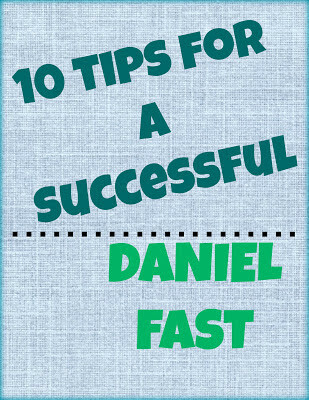 Stir the dough with your fork until it makes a cohesive ball of dough. You may need to add an extra small spoonful of water if the dough is too dry. Be careful not to add too much though. When the dough forms a ball, knead it about 20 times. Then let it rest in the bowl for about 10 minutes. After it has rested, form it into 10 or 12 equal balls. Roll each ball in a little flour, to coat the outside of it evenly. Place a ball of dough on a sheet of waxed paper, or a clean, well floured surface. Roll the dough out into a a 6 or 7-inch circle. Try to get it as thin as you can. 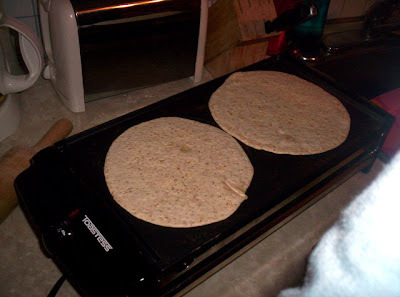 Loosen the tortilla from the rolling surface. Flop it onto a dry, hot skillet. Cook about 30 seconds, until the under side is dry, with a few brown spots. Flip it and cook the other side the same way. Transfer the cooked tortilla to a plate, and cook the next one. This goes pretty fast after you get the hang of it. You can roll out all of the tortillas first, in one stage, and then cook them all in the second stage. After you practice it some, the whole procedure takes less than 20 minutes, and the tortillas are sooo good. Use them the same way you would store-bought tortillas: burritos, soft tacos, etc. To make them more flexible, place them in a plastic bag while still warm, and let them cool right there in the bag. The steam will make them more pliable, and easier to roll up into fancy burrito shapes. Last week I made a big pot of spaghetti sauce. Its always nice to make this meal in a large quantity so you can freeze the sauce to re-heat and use as left overs. Last week I decided that instead of eating spaghetti two nights in the week that I would try spaghetti pie. The recipe is one that my friend Beverly makes with her left over spaghetti; the recipe comes from more with less cookbook. There isn't really specific measurements so I was worried that it wouldn't turn out...I was wrong it was very yummy and is a recipe that I will be adding to our menu as it tasted wonderful and it freezes well to!! Grease a pie plate. Make the crust from about 2 servings of cooked spaghetti noodles, 1 beaten egg, about 1/4 Parmesan cheese, and a little melted butter. Mix together and put in plate. Put some grated cheese on top and then your spaghetti sauce. Add more grated cheese and bake 350 x 25-30. Enjoy. This pie can also be made into spaghetti pizza, that's how hubby likes it! To make the pizza I simply whip up the noodle base as shown above. 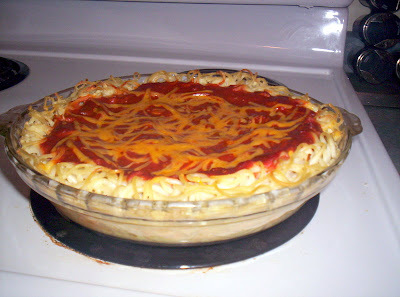 Then I spread it all over a pizza pan and bake the noodles in the oven for about 12-15 minutes at 350. We like the noodles to be crispy. After they have cooked a little while I add the sauce and pizza toppings. This has become such a yummy treat in our house. Another recipe that goes great with this are this simple (and very delicious) bread sticks. 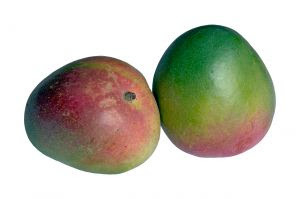 Well I am not sure if my addiction to Mango's is getting worse because they have been on sale lately or what is going on, but I just can't seem to get enough of these odd shapen, half green, half red juicy fruits. I enjoy them cut up in the morning with my yogurt and granola, I love them on their own, they are wonderful cut up in salads and my newest love is a creamy mango drink. Put all ingredients into the blender and blend until creamy. If its too thick you could add a bit more orange juice, but try not to add too much as you want to enjoy the full flavor of the pureed mango. You can put these drink into the refrigerator to cool off before you drink it. 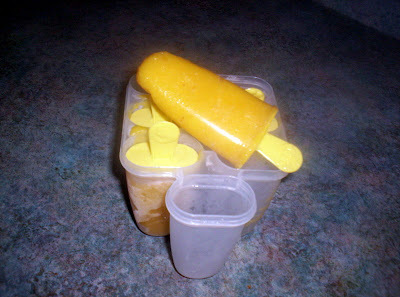 I made this drink last night and decided because of the nice weather that I would try to freeze it to make smoothie Popsicles out of it. They taste fantastic! Mango's are a great fruit as they promote contractions and enhance our digestive process. They are a source of vitamin A, B and C.
So what do you do with your mango's??? Hey everyone! A couple of weeks ago at mothers club one of the great mothers who attends talked to us about organization, budgeting and meal planning. After she gave us a list of website to check out. I was really interested in both her website and organizing junkie. One of the things that attracted me to Organizing junkie was that every Monday the author host Menu Plan Monday. Different bloggers enter in their meal plans which provides readers with LOTS of ideas for meals! I have been enjoying seeing the different recipes that can be made. This week I have decided to take part in Menu Plan Monday. I hope that some of the recipes are helpful!! The other night I had a baby shower to go to and was asked to bring salsa and chips....now being a Dietitian this was an ironic thing to ask me to bring so I decided to do a healthier alternative to the traditional yummy late night snack. Combine BBQ sauce, oil, garlic and seeds. Brush over tortilla chips. Cut chips into 8's like a pizza (I use scissors or a pizza cutter works great to). 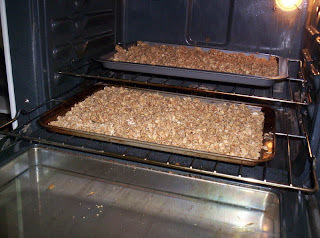 Place on baking sheet and bake in 300 oven for 7-10 minutes. Let cool then place in air tight bag ( I usually just use the tortilla bag they come in). This recipe made a lot of salsa....so what to do with the left overs?? Usually on Sunday nights we don't make a big supper because we eat a later lunch, so tonight since my husbands favorite hockey team is playing I decided to make him a treat for the game. I took some hamburger and fried it up with onions. After draining the fat off of it I added the left over black bean salsa, taco seasoning and a bit of salsa. Well that was simmering on the stove I baked real tortilla chips (Old Dutch, Multi grain is our favorite). Once it was done simmering I topped the baked chips with the mixture and graded mozzarella and cheddar cheese then baked at 300 for 5 minutes!! This was very filling and tasted delicious!!! 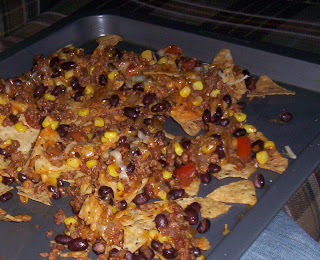 Nachos can be part of a health diet and are fun to have as a supper treat. You can add lots of different toppings such as chicken, beef, refried beans, peppers, tomatoes, and onions to your nachos. 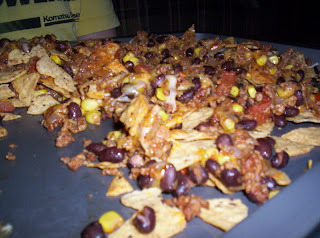 Let me hear some of your nacho combos!!! So last night my wonderful husband decided to make supper; because we had such a late and big lunch with my mom and Kathy he decided to do something light. 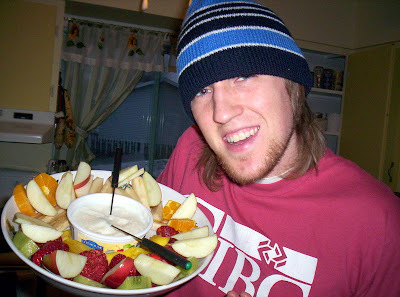 While I was putting down the babe he was busy at work peeling and cutting up lots of different fruit. We enjoyed this wonderful variety of flavors and colors as we sat on the floor and watched the hockey game. 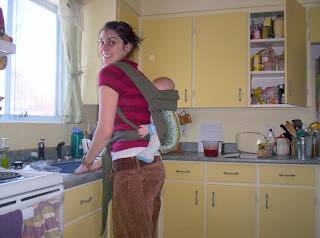 With a new baby around the house its been a little bit more difficult to get into the kitchen to get things done....well that is where baby wearing comes in!!! One of my dear friends let us borrow her babyhawk baby carrier for a little bit and it has been the best thing ever!! I have been using it a lot around the house so my hands are free to get things done when my little one wants to be close to me. Because we were expecting a winter baby we didn't bother getting a stroller so this carrier plus the Snuggli has been great for going out for walks. Micah has also been enjoying the carrier as well. 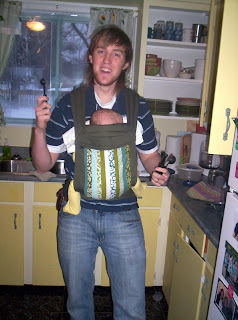 He usually spends the morning with the little guy and finds he can get lots done with two hands free!!! Hey...sorry I have been so long since the last post. Life is pretty busy with a teething 3 month old and my Dietitian exam is coming up next month. Every spare moment I have these days I have been spending it with my nose in my books. I do want to share with you a recipe that a friend of mine shared with me. 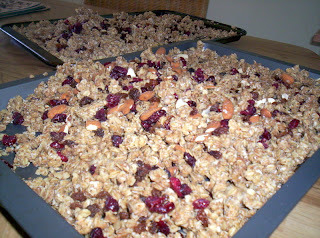 She makes this Granola monthly and gave me the recipe. Its from the cook book more with less. It has a delicious flavor that goes great with your morning cereal, is a lovely topping on yogurt and even is a great snack on its own. * I also added cinnamon, nutmeg, sesame seeds, cornmeal, ground flax, and sunflower seeds. 4. Add wet to dry and mix. Granola is such a wonderful super food because the ingredients in it provide the body with essential vitamins and minerals it needs to function. Also many of the ingredients in it provide other GREAT benefits that will help you get through your day. Just to name a few; wheat germ is a delicious source of zinc, vitamin E, folate, and other B-complex vitamins. It helps the body maintain energy levels, enhances fat metabolism and helps to protect against heart disease. Oats are a great food because they help to lower levels of cholesterol while providing you with a great source of iron, fiber, protein, carbohydrates and folic acid. We all know that almonds have many healthy benefits and should be incorporated into your daily diet as they help maintain healthy body fat levels and strengthen the cardiovascular system.